North Eastern Railway (NER) authorised the construction of the experimental Petrol Autocar No. 2105 on 21st September 1922. On 19th October, Raven reported the purchase of a 6-cylinder 105hp Daimler engine from the Slough Trading Estate Co. Ltd. The remainder of the vehicle was built at York Carriage Works and was completed in July 1923. By this time, Grouping had occurred, and the autocar was given the LNER number 2105Y. It was later renumbered as No. 22105 in August 1926. 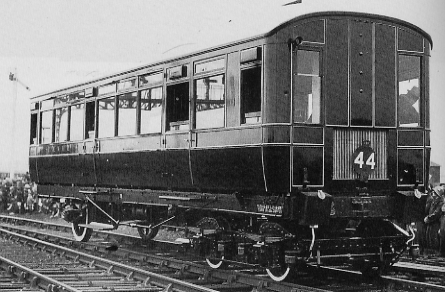 The autocar could seat 40 third class passengers in seats that were arranged as pairs on either side of the central gangway. The distinctive wheel arrangement had a two axle bogie at the engine end, and a single fixed axle at the other end. The single fixed axle was powered from the motor via a clutch, three-speed gearbox, and propeller shaft with two universal joints. 40mph was reportedly possible. Radiators were fitted to both ends. Westinghouse and hand brakes were fitted. The autocar was not designed for towing other vehicles, but it did have limited facilities for being towed in the event of a breakdown. Sandboxes were initially absent but were fitted at a later date. No. 2105Y entered service on 9th July 1923, and initially operated the local York services then being operated by Petrol Rail Motor Bus No. 130Y. The service was extended slightly with the new vehicle, and included lunchtime weekday trips to Church Fenton. The exact duties would be often modified, but No. 2105Y would operate local services in and around York until 1930. In common with the Petrol Rail Motor Bus No. 130Y, it also took part in the Stockton & Darlington Centenary celebrations. Haxby, Strensall, and Flaxton stations all closed in 1930. This greatly reduced the work load for No. 2105Y (now No. 22105). It appears to have only been occasionally used, although records are unclear. However, No. 22105 is known to have been given an extensive timetable in the Hull area from 1st May to 17th July 1932 when it worked a 14 hour timetable including Beverley, Thorne North, Brough, Willerby & Kirk Ella, and Hull. Reports suggest it was unreliable during this period and was often replaced by a Sentinel steam railcar. No. 22105 does not appear to have worked any revenue-earning services during the next two years, and was finally withdrawn from service on 19th May 1934. No. 22105 was withdrawn in May 1934, and did not enter preservation. I am not aware of any models of the NER-designed petrol autocar in any scale.